Army announces plan to cut 40,000 troops at U.S. bases to save $7 billion. Soldiers from the U.S. Army’s 3rd Brigade Combat Team stand at attention at Fort Knox Army base. The Army announced on Thursday it will reduce its size by 40,000 soldiers over the next two to three years as part of a cost-cutting measure. 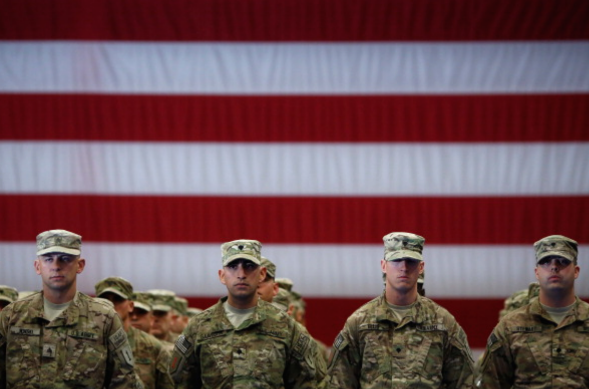 The reduction will bring down the Army’s troop count to 450,000—down from about 570,000 five years ago. “If Congress and the White House cannot avert another round of budget cuts this year, even deeper troop reductions would result,” Army officials told the Associated Press. The decision to make cuts, which include 17,000 civilian Army employees, was made last year, but the specifics of the scaled-back force were only relayed to Congress this week. The biggest soldier reductions will be from bases in Georgia, Texas, Washington, Alaska, and Hawaii. Fort Hood in Texas will take the biggest hit, losing 3,350 soldiers or 9 percent of its workforce. The Army has not been keen on making the cuts, but Army leaders signaled that a force of about 450,000 would be sufficient. Anything less than that poses a “significant risk” to the military’s ability to respond to “unknowns”—namely pop-up contingency operations that are difficult to predict. If mandatory spending cuts known as sequestration remain in effect, the Army could shrink even further, to 420,000, Army officials said Thursday. Five years ago, the Army had about 570,000 soldiers. An Army official who briefed reporters said many reductions would occur through attrition but some soldiers would be forced from service… Many Republicans would be willing to roll back Pentagon reductions, but the White House has insisted that across-the-board cuts mandated by Congress apply to the entire federal government, without exceptions for some departments or functions. The cuts, which the Army estimates will save some $7 billion over four years, come at a particularly turbulent time in American foreign affairs. “Any conceivable strategic rationale for this cut to Army end-strength has been overturned by the events of the last few years from the rise of ISIL, Russia’s invasion of Ukraine, the Ebola crisis, and more,” Sen. John McCain, head of the Senate Armed Services Committee, said Wednesday.